When Kobo relaunched their Windows 8 app earlier this year they also mentioned that a related app for Windows Phone was in the works. That app launched with little fanfare yesterday. Windows Phone users now have a new option for reading in addition to the Kindle and Nook apps. 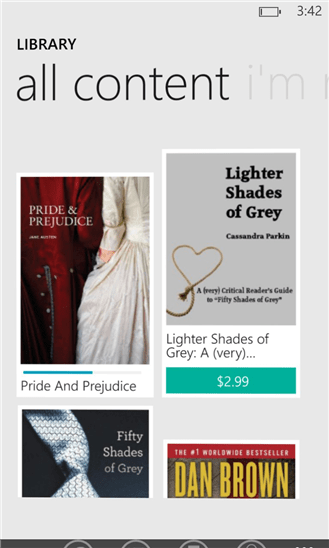 The Kobo app is free to download from the Windows Phone Store, and it offers access to a catalog of some 4 million titles, including ebooks, comics, and children's books. Pick up right where you left off. We’ll sync your bookmarks so you can keep reading across all your devices. Customize your reading experience. Enjoy crisp, clear text, in the size and style you prefer or try Night Mode for easier nighttime reading. Quick access to your recent reads within the app and from Live tiles. Have you tried the app? What did you think? Well that’s good news as the Nokia 920 I have is actually pretty decent for reading on, and there’s a real shortage of decent apps for it. App seems decent enough, but I can’t figure out how to load my own content. Adding my own content from the Win8 app is easy, but doesn’t seem obvious from the WP app. If anyone figures it out, please reply and let me know. pretty sure there’s no nook app for the windows phone 8…..
You’re right; that died stillborn. I was thinking of the app for Windows Mobile Phones. The Kobo app for Windows 8 phones has a problem downloading some text-only eBooks – shows covers, seems to start, but then hangs. Reinstalling doesn’t help. Android version is just fine.